There is some confusion about honing plated cylinders, so let's see if I can clarify a few issues. These are my personal observations and the decision to hone, not hone or replate is always taken on a case by case basis, what you do to a cylinder is at your risk. 2- how do I tell if the cylinder needs honing? The cross-hatch pattern holds lubricating oil, if it has gone or is glazed ( a brownish coating common in 4 strokes) you will need to hone. If there are light scores that can barely be felt with a finger nail you maybe able to reclaim the cylinder with a hone. 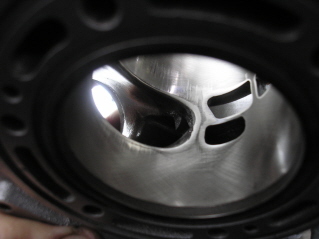 4- the piston has seized and some alloy is stuck to the bore. If it's a light seize the aluminium from the piston can be removed with muriatic acid* (hydrochloric acid) without harming the plating, afterwards the bore can be cleaned with a scotch brite pad or hone. Be careful, the heat generated during a seize can cause the plating to lift, if there are signs of this send it to us for a replate. * these are dangerous chemicals, follow appropriate safety procedures. So how do I hone the cylinder? 2- standard abrasive hones may be used to prepare the bores for new rings, they must not be used to remove any material as they will tend to smear the material instead of cutting it.Be very careful what type of hone you use, a rigid hone is best, if you are honing a 2 stroke cylinder a hone designed for interrupted bores (keyways etc) will work well. There are stone sets available from $unnen that fit their standard automotive hone head which make a reasonable job but the minimum size is about 65mm. Never use the spring loaded, 2,3 or 4 leg hones available from many outlets, these can make a real mess of bore geometry and will do nothing to improve roundness or taper, for the price of one of these hones you can get you local machinist to hone your cylinder. 3- what grit, that's a trick question, we use diamond exclusively and that runs a different classification system, but as a guide 280-320 grit for a start and then 600 grit to finish followed by cork or plateau finishing tools. The cork /PHT finish is needed to remove the fine (microscopic) fuzz from the surface but don't over do it, 4 strokes is usually enough. Don't forget the all important cross-hatch pattern, aim for an angle of 30º to 45º from the top surface of the cylinder. 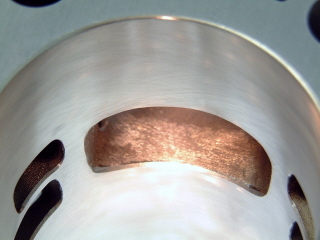 Here you can see the damage done to port edges when a cylinder is honed "for a few seconds" by a flexible hone; it was not visible until we made a couple of passes with our fixed hone head. Click on the photo for a closer look; use your browser back button to return here.